Turn one gets started with Mastadon poo flying all over the field, surpassing two of my Silverbacks, a few recon units, my attack units, and just being annoying. Shock (8) ain't no joke! 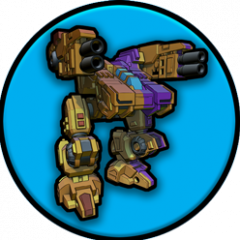 That said, I went first and drilled the recon Sabretooth with some heavy Guided Missiles and put four damage on it if I remember correctly. The rest of the forces were just lobbying for position, aka moving forward. Now we get into the highlights. Sorta. The Tigers split and one moves and picks on the closest Silverback doing two damage while the other goes to face down my attack section with the Sabretooth. My Silverbacks respond and drop that Tiger down to track 9 (seriously, don't sleep on heavy Guided Missiles!). The other tiger takes a point of damage for all my efforts with my attack squad. More Mastadon recon sniping and I was able to jam his Catamount for a couple turns in a row, denying it's APA2 and ECM2 for awhile. Wow, this turn was pretty much the end of the game. The highlight though? When his Mastadon's do activate, one of them rolls a double one, so I get to chose it's strike point. I put it on the mauled Tiger and MiniAddict kills said Tiger with the damage roll. It was also the CO. Guess he'd pushed that Mastadon pilot too hard in PT or something! My attack section benefited from the CO and APA and combined fire on the other Tiger and took IT down to track 9. The rest is a blur. I know their remaining Sabretooth started snipping at recon units, helping the Mastadon's clear them out while the Tiger did two damage to the Catamount before being demolished. Mop up operations start from here. The Tiger gets snipped by the Catamount to finish it off, while my Attack section puts some fire on the Catamount and cripples it. 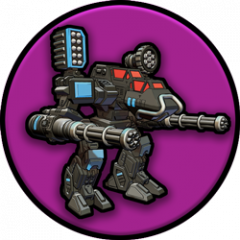 A Silverback wanders that direction and lobs some missiles for fun at the Sabertooth and nearly blows it away. The other two Silverbacks kill the two recon squad Cougars. I lost Puma's like crazy though and I believe this was their last turn. Splitting fire, one Cataphract kills the Catamount, the CO kills the Panther, and the Sabertooth kills the attack squad Cougar. Just like that that whole flank disappears. The Silverback kills his Sabertooth and the destruction is total. The other two Silverbacks put four damage on his center Mastadon and while mastodons focus on my cougars and kill one eventually. Attack squad finishes off the Mastadon in the middle while the Silverbacks focus on the far right side Mastadon and do four or five damage. We call it after that. So, in conclusion, I still feel the Mastadons can't carry their weight at 1720's threat value under the CAVCon Tournament rules. They just don't do enough damage for the points. They are good at weeding out recon and low armor elements, but at the expense of the rest of the force. While guided missiles were "nerfed" after the first CAVCon, they are still pretty robust and strong. They aren't instant suppression like the Mastadon's AoE of doom, but at Shock (6) it can come up from time to time. I liked how my list operated though with the constant bombardment of my recon elements, lost out on some of the highlights I'd hoped to bring. APA2 came through in turns 3 and 4 and helped swing the numbers to really dispatching my opponents units! Thanks for the great report! Also, like the intro pic of the unit, thanks.